The Employees who are working with the State Government in Andhra Pradesh and Telangana both Government Employees Now Check their GPF (General Provident Fund) Balance and Account Status online and download GPF Slips Online. This Facility Provided Account General (AG) of Andhra Pradesh and Telangana. The office of AG (Account General) Dept is responsible maintaining the Accounts of the government of Andhra Pradesh and Telangana. Employees now Visit The AG Dept Official Website http://www.agap.cag.gov.in/ and Check their all information about GPF Account Status and Statement. The Principal Account Genaral (A&E) maintains the individual GPF (General Provident Fund) accounts of nearly 2.9lakh employees of the AP State Government. as per the rules and procedures contained in the GPF (AP) Rules 1935 and Ais (PF)Rules 1955 respectively. The Provident fund Group in the office is headed by an IA&AS Officer the rank of Deputy Account General. The GPF is Constituted with effect from 1st April 1935. The following Categories of staff of the Govt .of AP are eligible to join the Fund. All Government servant including those appointed on or before 31.082004 under rule 10(a) (i) of the state and Subordinate service rules and eligible. All re-employed pensioners (other than employed for admission to CPF) and those Government Servants who have not completed one year service shall be eligible on option. Provident Fund is maintained by PAG for the following Categories of employees. 1. Class III, Class II and Class I including Reemplyed. 2. Employees of Local bodies,Municipalities,Panchayat Raj Institutions. 4. Employees of state Govt.appointed on or after 1.09.2004 who are covered by new Contributory Pension Scheme. How to Check GPF Account Status and Statement in AG Andhra Pradesh and Telangana. The Employees who are working in the civil and Public departments under the state Government of Adhara Pradesh and Telangana will have to provide a GPF Number they can access to their Account. After getting the GPF Number follow below inst ration for Check GPF status and Account Statement. 3. Scroll down and Select option of 'GPF Slip' You'll will See Below Screenshot Type of Web Page. 4. 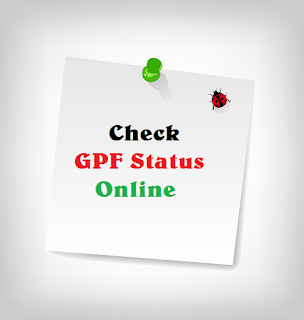 Now Select the year of Which you want to check the status of GPF Annual Statement. 5. Than Select the Department. 6. Enter your GPF Account Number Wich you want to got from your teasury. 8. Now Click on "GO" Option and get statement of that year which you want to selected. How to Register Mobile Number to GPF Status and Account Statement. Who can avail the facility ? Pensioners whose Pension cases are being finalized by AG. 1. Dial 040-23231212 to access the IVRS facility. 2. Provide the GPF Number allotted by AG. 3.When Prompted, Dial '0' to register the mobile number. 4. Enter the mobile Number. 6. Confirm the Correctness of the mobile number when Prompted by the system. 7. System Prompts the acceptance of the mobile number. 1. Dial IVRS Number Provided by AG office. 2. When Prompted Dial '4' to register the mobile number. 3. Enter the mobile number. 4. System will be spell the number the mobile number. 5. Confirm the Correctness of the mobile number Prompted by the system. 6. System Prompts the acceptance of the mobile number. Download EHS Health Card Online.